Here at The Next Web, we publish 200 posts or more every week. 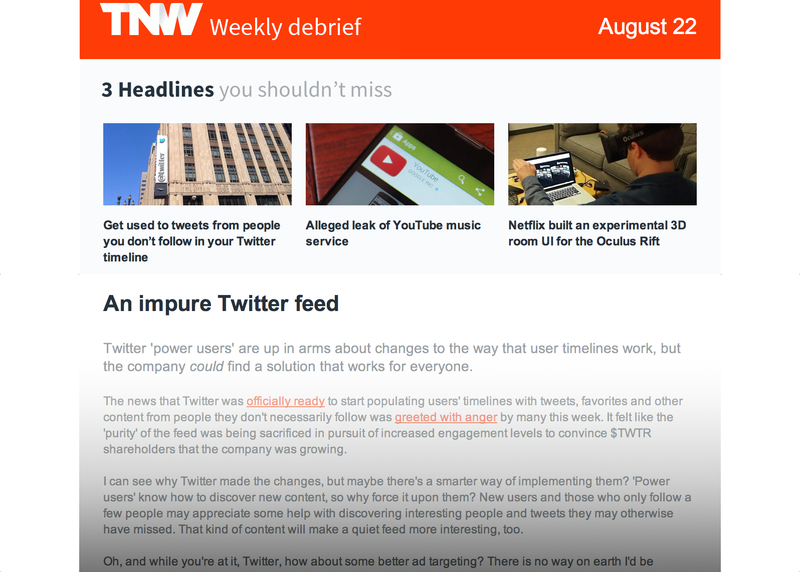 TNW Weekly is a new way to keep track of the pick of the crop. We’ve offered daily and weekly automated emails with links to our most-shared stories for some time. Last month we decided to try something different with the weekly email – a debrief curated by me, your humble Editor-in-Chief. It features original content and hand-picked stories – the articles from the past seven days that I think you need to see. Aside from a few tweets, we haven’t really promoted it at all, but the reaction has been great. We’ve had people saying that they look forward to reading it every Friday, people appreciating the personal touch and even people saying that they’d be happy to pay for it (don’t worry, it’s free). If you’re curious about TNW Weekly, click here, enter your email address and select the correct checkbox. You can also subscribe to daily automated emails of the most-shared stories and breaking news alerts for only the biggest stories too, if you like.